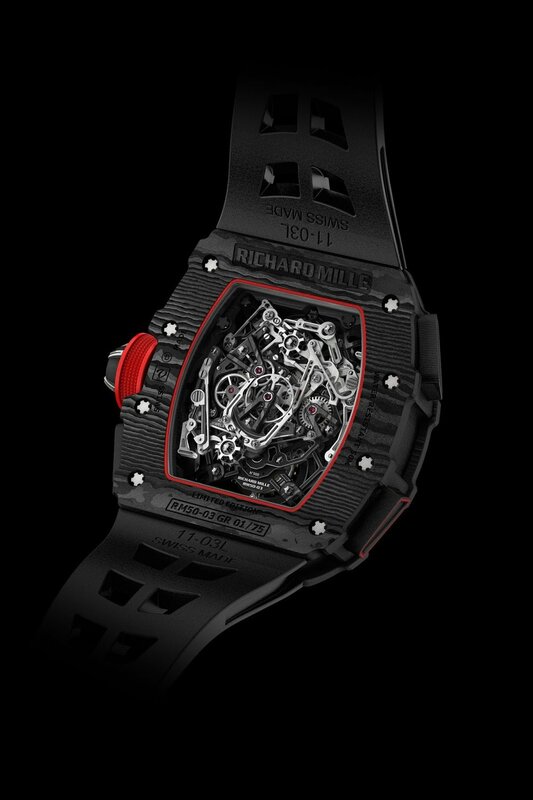 with the goal of breaking records equivalent to those held by McLaren F1, Richard Mille propelled the world's lightest Split seconds tourbillon chronograph at (SIHH). The RM 50-03 Tourbillon Split Seconds Chronograph Ultralight McLaren F1 weighs 38 only grams. The Watch is made of titanium and TPT Carbon (one of a kind to RM watches) the brand worked with the University of Manchester to incorporate graphene – a 2D material that is one molecule thick – and TPT Carbon in its new models. A special graphene-based composite – known as Graph TPT – was made to build the watch's case. This watch is limited to 75 pieces with a $1 Million Tag , So now is the time to break your Piggy Bank.